What's my favorite thing about Gossip Girl (aside from Penn Badgley, that is)? 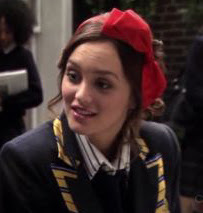 It's seeing all the gorgeous headbands that Blair Waldorf wears show after show! From Valentino to Stacey Lapidus, she's got the market cornered on fabulous headwear. And the best part is that all sorts of designers are following suit and offering up tons of great options. So of course The Beauty of Life's first-ever Trend-Filled Thursdays column, which focuses on trends from the runway and entertainment, simply had to be about headbands! Whether you like 'em wide or skinny, satin or wire, plain or patterned, there's one out there for you. Here are my two faves! 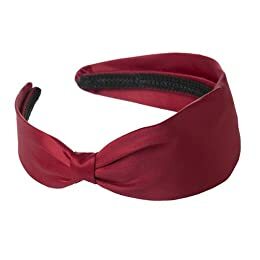 Erin Fetherston for Target Satin Headband: I love everything about it, from the knot detail at one side to the oversized silhouette to the gorgeous crimson satin. And the price? How can you not pick this up? Rachel Pally Headband: Love. Love, love, love. It's so simply chic! Hi, came across this post looking for some Blair Waldorf style stuff for halloween ideas! I like what you've shown. Katie -- Thanks so much! I'm glad you liked these options. Thanks for reading!